Yes, young scientist, your field experiment IS doomed. Does it ever seem like the universe is has something against your field experiment? That’s not your imagination. 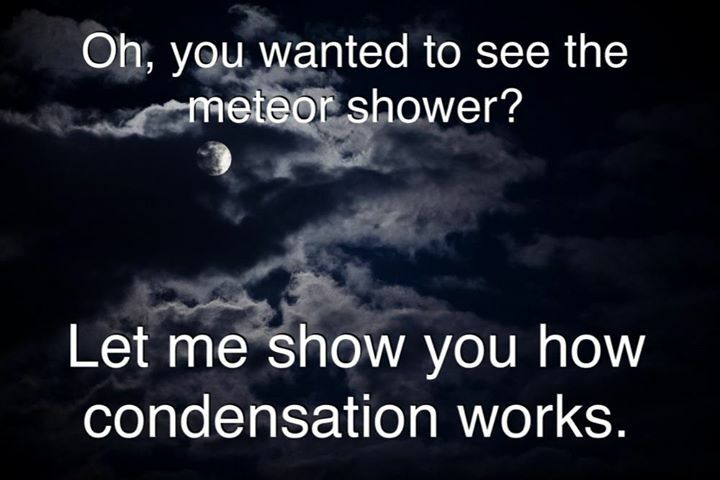 Nature is definitely trying to undermine you. Whether you’re in middle school searching for a science fair project, 84 years young and trying to determine what sort of animal is eating your garden, or a struggling PhD student hoping to make a career out of field research, I hate to tell you this, but your experiment isn’t going to work the way you thought it would. Instead, you’re going to learn so much more. Or you won’t, either way. So try to enjoy it. I stole this from IFLS because it captures the nature of field research so perfectly. My friend Ben Blonder learned a little about precipitation instead of plants when he arrived high in the Rocky Mountains of Colorado to set up a long term field experiment earlier this summer, and found the entire site was still under several feet of snow. You can read about his subsequent adventures that he detailed on his blog. I also learned a little about precipitation after one of my fluorescent-tracking experiments was destroyed by a monsoon rainstorm. These are the steps that are usually left out of how the scientific method is taught in school. You thought there was only: 1. Make observations, 2. Form a question, 3. Define a hypothesis, 4. Design methods, 5. Collect and analyze data, 6. Draw conclusions, and 7. Communicate your results. What they don’t tell you is that in between the steps of collecting and analyzing data, you have to insert: 4a. Realize your methods don’t work the way you expected, 4b. Redesign methods, 4c. Collect more data the new way, 4d. Repeat an unknown number of times. I like to think that with more experience, those steps might drop out of the method. But I have a sneaking suspicion that instead, you simply become resigned to their presence and learn to expect them. I could identify the trails and general movement if I just zoomed out, got my nose off the ground, and walked around (their little feet and tails and tummies track it around widely). This species does not tend to cache seeds outside their burrow as often as I thought they did. Animals are jerks (they really are) and will do whatever you least expect them to do. I realized I needed to examine a much larger set of instances of animals taking seeds from experimental depots I provided. I also realized this was possible to survey much faster with less detail, but greater understanding, if I walked around and generally looked at their movements – and that way, I might actually find some of the caches I was really interested in. But of course my experimental depots were washed away by a large rainstorm in the driest part of the driest mountain range near Tucson. So, with a sinking feeling that I was wasting my time, I spent a few hours re-baited them all, even though it was predicted to rain again. This is monsoon season in the Sonoran Desert, after all. But it was a lovely few hours hiking in the desert, and hey, I probably needed the exercise. Then, last week, armed with my UV flashlights, I headed out to survey for footsteps and caches. I still had never found one of their caches. 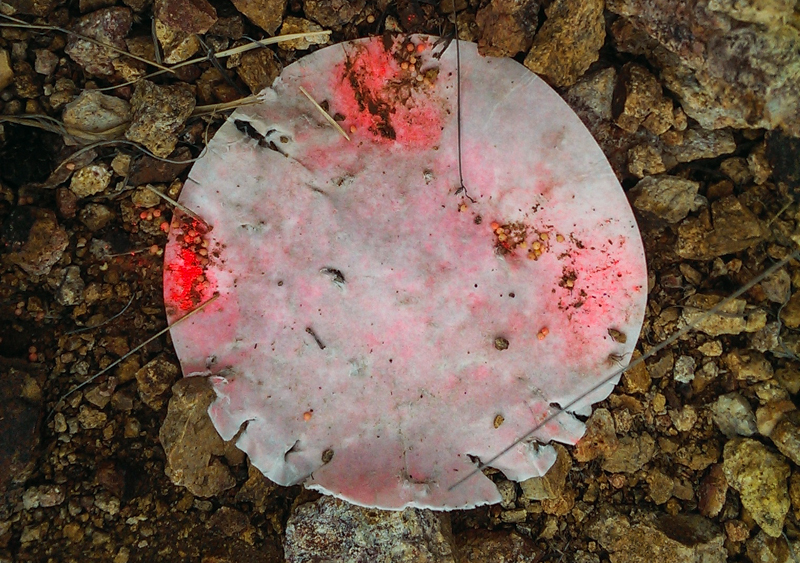 I knew what to look for by reading about them: signs of recent digging, with fluorescent dust in the apron of disturbed soil. I had seen the disturbed soil after recent digging was recorded by my game cameras. And on this rocky, hard-packed desert pavement hillside, recent digging is pretty rare and noticeable. 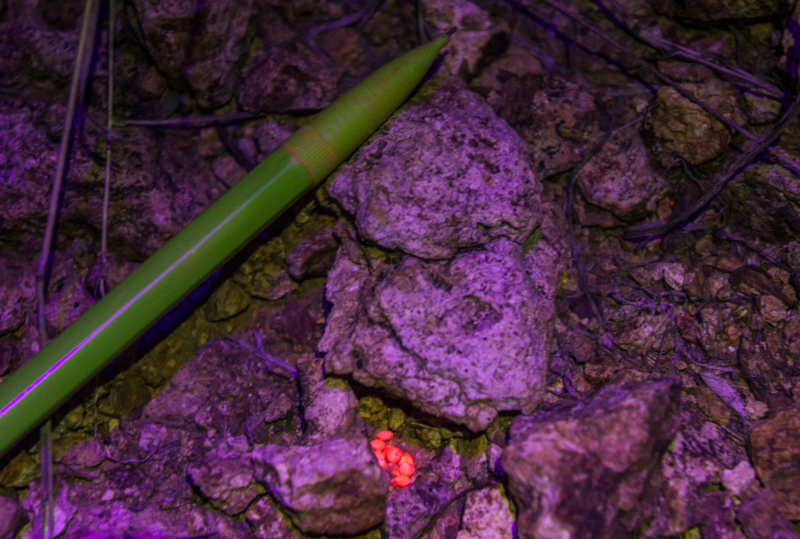 Fortunately, I brought a friend along who thought a night time hike in the desert with black lights sounded like a great way to see some scorpions, tarantulas, and other wildlife. (Lightning, too, as it turned out.) As we surveyed the second-to-last depot, he pointed at something glowing bright. Uphill of the depot was a little pile of nine seeds, carefully piled between some pebbles. This was not a random arrangement of some seeds that had been dropped. As we walked back along the rest of the depots, we found several more definite caches, and a few that were definitely non-randomly placed, but didn’t look very well hidden from pilfering neighbors, so I’m not sure what to make of those. But it turns out I wasn’t finding dug caches because these pocket mice don’t try to dig most of them – would you? If all you had was your hands and nails against the caliche and the rocks? Instead, it might be easier to cover them in a little pile with rocks in a crevice, or under a nice dense bunchgrass. 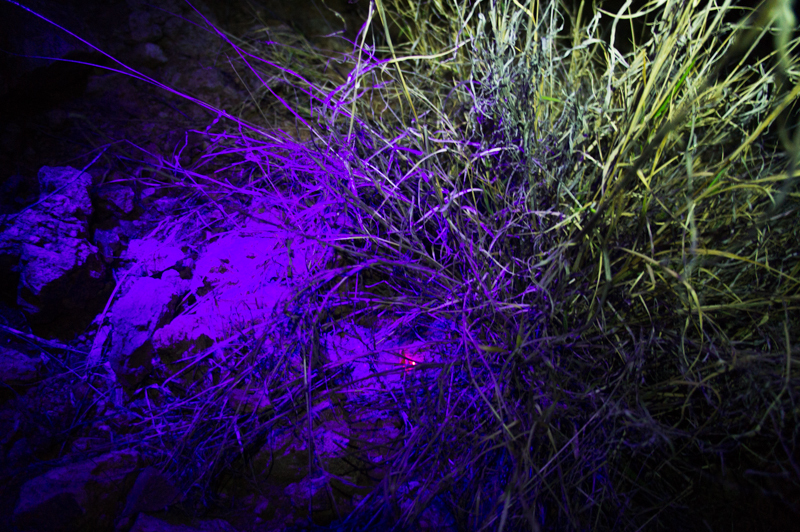 A cache of seeds fluorescing under a UV flashlight where they are hidden in a dense bunch of invasive grass. Just when I was ready to finally give up on this doomed field project, it reeled me back in by spitting out some data. This may be the most emotionally abusive research ever, or, well, just the usual doomed research process. Have fun. If nothing is going to come of this anyway, make sure you got a lovely hike in, or listened to some rad music while collecting your useless data, or otherwise enjoyed the wasted time. Try to adopt a framework that includes variability in the environment as part of your understanding, rather than pretending it doesn’t exist. Be flexible, and ready to improvise. Get your friends involved, whether or not they’re experts in this arena. They have good ideas. Don’t be embarrassed to talk about the project with anyone you can bring it up to – you never know where that key suggestion or offer of equipment will come from. Don’t give up. Every research project is doomed, until it isn’t anymore. Maybe you can’t collect enough data to be useful in one season, but after 20 seasons, it might be pretty interesting.